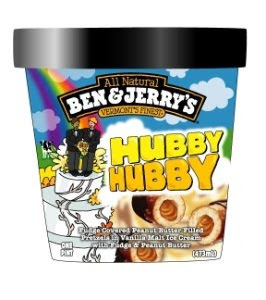 As if you needed another reason to love Ben & Jerry. The company known for its hormone-free ice ice cream, thoroughly uncorporate approach to naming flavors, and support of social causes, announced yesterday that to celebrate gay couples' newly won freedom to marry in their home state of Vermont, it's changing the name of one of its flavors for the month of September. Chubby Hubby is now, tah-dah, Hubby Hubby. Personally, I'm going to celebrate celebrate with a pint of Pistachio Pistachio. Cute theme, but heath bar crunch and phish food are still my favs. Oh, honey, that gooey chocolate WILL round you out!